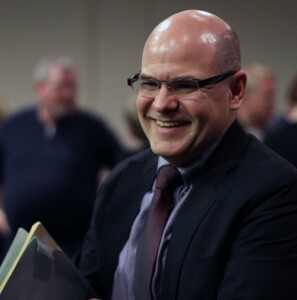 Born in Caracas, Venezuela (1965), Alfonso Tenreiro received his musical training in Composition, Choral Conducting and Organ from Indiana University in Bloomington. Tenreiro’s compositions have been performed and recorded in Venezuela and the United States. His work Guri was recorded in the CD Venezuelan Classic of the 20th Century by the Caracas Symphony Orchestra in 1988. Another CD, Tenreiro by Riazuelo, was recorded in 1992 also by the Caracas Symphony Orchestra containing a collection of some of his symphonic works: Remembrance, Aluminum, Concertino for Harp and Strings, Memories of the Centaur, Fountains, and Image of Light. Works contained in this recordings have been awarded by the American Society of Composers and Publishers (ASCAP), Indiana University and the New York Youth Symphony Orchestra. 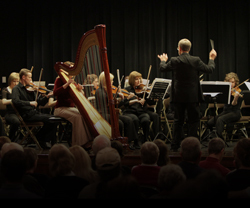 These works have also received recognition from the World Harp Congress (Paris), Bowling Green University (Ohio) and the American Composers Orchestra. Tenreiro has received a number of symphonic commissions including those from the Utah Arts Festival, New York Youth Symphony with performance in Carnegie Hall, Columbus Pro Musica Symphony, Caracas Symphony Orchestra and Sinfonietta Caracas. Several commissions have also been funded by the Venezuelan Goverment and others by private individuals. Broadcasts of his music include American Airlines Airwaves, Indiana Radio Stations, Venezuelan Radio Stations, and KUER of Salt Lake City. Tenreiro was recipient of the 1998 Venezuelan Biannual Prize of Composition “José Angel Lamas” with his Symphony #1 (Sinfonía Sacra). In 1999, he was also recipient of the “Composer Commission” of the Utah Arts Festival. Mountain Echos was premiered by the Utah Symphony in June 24th of 1999 under the direction of Maestro Keith Lockhart, and performed in three different stages. In 2002 he composed Caroní, completing of a trilogy of works on Guayana (Guri, Aluminio & Caroní). In 2009, Tenreiro traveled to the Czech Republic for a recording of his very unique work, Meditation by the Moravian Philharmonic Orchestra. He presently resides in Utah with his wife Elizabeth Tenreiro and his son Stephen. The entire family enjoys the beauty of life in Utah which lends to outdoor recreation including snowboarding, biking, swimming and waterskiing at some of the many local lakes. Alfonso’s other passion is cooking, his roast beef with chimichurri sauce is one his specialties. His culinary creations are imbued with an international flair and his family and friends line up to enjoy the feast.